A secret rating system used by retailers determines everything from how long they keep you on hold to what kind of upgrades you receive on airlines and at hotels. Experts tell us these women's wait times are likely tied to the secret file companies keep on shoppers known as "customer lifetime value" or a CLV score which means how valuable you are as a customer. USF marketing professor Dr. Dip Biswas says companies use those scores to decide everything from how long to keep you on hold to how nice of a hotel room to give you at check in. “If you are looking for an upgrade the customer lifetime value helps,” Dr. Biswas said. Dr. Biswas says customers with higher scores are those that usually pay full price and have a store credit card. Those with lower scores are likely discount buyers who repeatedly call customer service. “If you are a customer for whom saving money is more important I would say do not worry about the CLV score.” Biswas said. 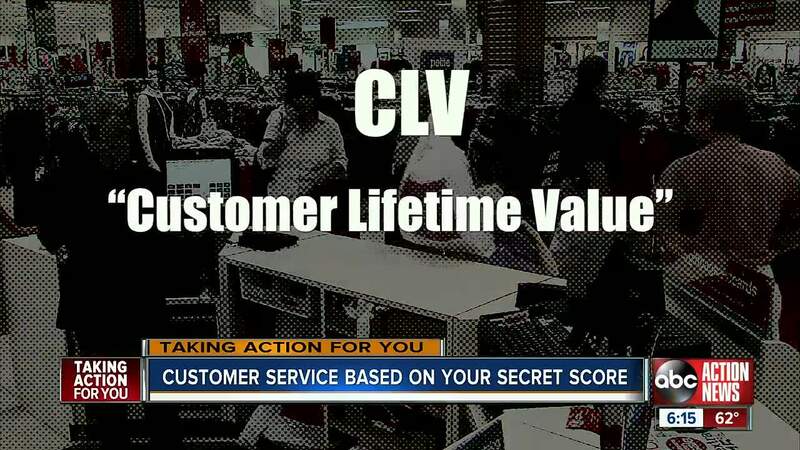 And unlike your credit score you may never know your consumer lifetime value rating because most retailers keep it a secret. Those who value customer service over price can increase their score by practicing store loyalty and applying for credit cards held by their favorite retailers or airlines. But if combing the clearance rack is more important to you, get used to the longer hold times.